In all of his various incarnations, Puck was famous for mischievous pranks and practical jokes, most of which involved shape-shifting. For example, the Irish Phouka would turn into a horse and lead people on a wild ride, sometimes dumping them in water, while the Welsh Pwca would lead travellers with a lantern and then blow it out when they were at the edge of a cliff. Being misled by Puck in this way was known as being “pouk-ledden”. Robin Goodfellow, however, was not only famous for shape-shifting and misleading travellers. He was also a helpful domestic sprite much like the brownies. He would clean houses and such in exchange for some cream or milk. If offered new clothes, he’d stop cleaning. Despite his existence in the popular imagination since the earliest times, it was undoubtedly a certain English playwright who was mainly responsible for re-igniting an interest in Puck which had been on the wane for several centuries until the Tudor period. 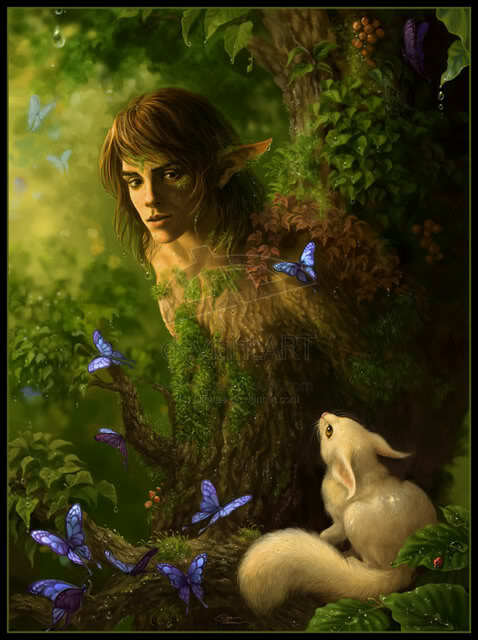 Puck, also known as Robin Goodfellow, as a character in William Shakespeare’s play A Midsummer Night’s Dream, clearly fixed the nature of the character in the English-speaking imagination for all time. Aside from Shakespeare’s famous use of Puck, many other writers have referred to the sprite as well. An early 17th century broadside ballad, “The Mad Merry Pranks of Robin Goodfellow”—which is so deft and literate it has been taken for the work of Ben Jonson—describes Puck/Robin Goodfellow as the emissary of Oberon, the Fairy King of the Night, inspiring night-terrors in old women but also carding their wool while they sleep, leading travelers astray, taking the shape of animals, blowing out the candles to kiss the girls in the darkness, twitching off their bedclothes, or making them fall out of bed on the cold floor, tattling secrets, and changing babes in cradles with elflings. All his work is done by moonlight, and his mocking, echoing laugh is “Ho ho ho!”. In a 1785 painting by William Blake , he is depicted as Pan from Greek mythology, while in an 1841 painting by Richard Dadd , Puck looks like an innocent child. 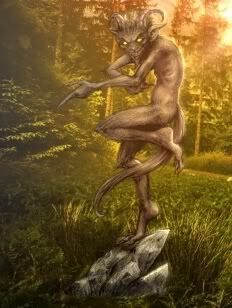 Despite this, Puck fell somewhat out of favour in the more puritanical 18th century, when fairies and fairy-like creatures were regarded as akin to the Devil. In the 20th century, however, Puck became a much-loved figure in children’s literature thanks to Rudyard Kipling. In a series of popular stories collected in Puck of Pook’s Hill (1906) and Rewards and Fairies (1910), Puck delighted two children, Dan and Una, with tales and visitors from England’s past. This Puck was “the oldest Old Thing in England” and was very critical of the common image of fairies at the beginning of the 20th century as “painty-winged, wand-waving, sugar-and-shake-your-head” things. To this day Puck continues to pop up in popular culture. For example, the six-foot tall invisible rabbit in the classic James Stewart film Harvey (1950) is said to be a Pooka. In Raymond E. Feist’s 1988 novel Faerie Tale, Puck appears as one of a variety of characters haunting upstate New York. Jacky Rowan, the heroine of Canadian author Charles de Lint’s contemporary fantasy novel, Jack the Giant-Killer is referred to as a Puck. A more mythological Puck has appeared in DC Comics/Vertigo’s dark fantasy series The Sandman (indeed that particular issue was, deservedly, the first and only comic book to win the World Fantasy Award for Best Short Story). Puck (or Robin Goodfellow, whatever you wish to call him) has certainly had a long and colourful past – and judging from his recent appearances, he may well have a long and colourful future ahead of him too. I learned something new by reading this. Thank you! I now realize qualities of Puck in various children’s stories such as the Spiderwick Chronicles.